My favorite mezcaleria, Union de Palenqueros de Oaxaca. The definition of “hype” is to “promote or publicize a product intensively, often exaggerating its importance or benefits.” After sampling dozens of different brands and types of mezcal in Oaxaca over the past four weeks I can honestly say that I think mezcal may rightly deserve to be called “over-hyped”. Let me start by saying I love tequila and prior to this trip I had already become a reasonable aficionado of tequila brands. But I had very little experience with mezcal, limited to a couple nights drinking from a bottle that someone had acquired on a trip to Mexico. In both cases I was underwhelmed by the taste compared to tequilas that I had drunk, even relatively inexpensive tequilas. I equated mezcal to a low-quality substitute for tequila. But apparently something happened to mezcal when I wasn’t paying attention…it became the new darling of the cocktail circuit. Now up-market cocktail bars back home in Portland are offering mezcal cocktails with all the fanfare that was previously reserved for the finest libations. And prices have skyrocketed. On the OLCC (Oregon Liquor Stores) website, of 33 brands of mezcal available, the lowest priced bottle was over $33 and most of the mezcals available start at about $50 per bottle and go as high as $250 per bottle. By comparison there are many decent tequilas and bourbons available for lower average prices. The last time I had looked at mezcal prices I think they were more in the $15-20 vicinity. Even in Oaxaca, ground zero for mezcal, the prices are high. Bottles range up to 2000 pesos or more. Shots around town start at about 30 pesos and can run up to 200 pesos for the best. That’s over $8 a shot, in a town where you can get beers in bars for as low as $.75 a bottle. So, when we arrived in Oaxaca and I started noticing that there are mezcalerias located nearly everywhere we walked in the centro, I decided to educate myself by stopping into many of these shops and sampling the goods. I have lost count of how many mezcal shops I have spotted in the city of Oaxaca; I’m sure the number must easily be over 200. I don’t know how many I have sampled, but it’s a lot…enough that I feel I have gotten a fair representation of what is available. 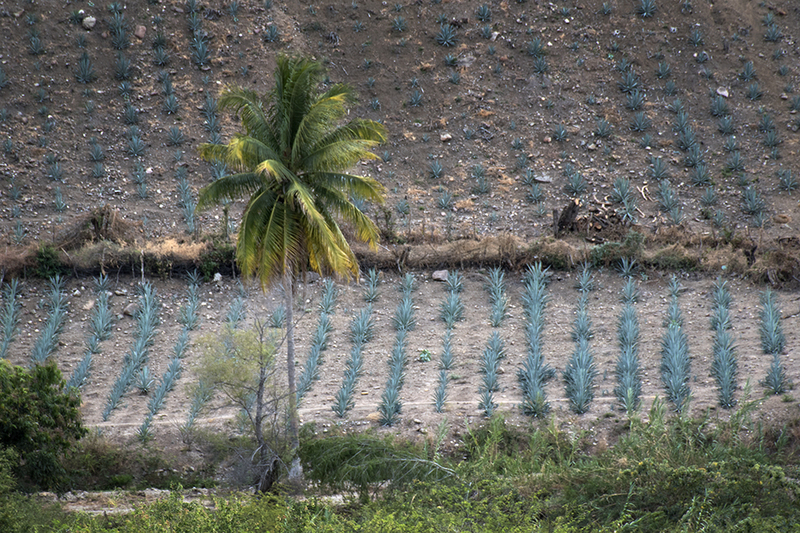 Agave plants from the bus window on the way to Oaxaca. My only formal tasting was at one of the more respected mezcalerias in town, In Situ, where they provide you with an informational card about each mezcal you try. They offer sample flights of three mezcals for 220 pesos (about $12). I asked the bartender to select three popular types which showed a range of mezcal types. He served me three 1 oz samples of three different blanco (or joven) mezcals. When I asked why none of the 180 or so bottles of mezcal I could see lining the walls seemed to be reposados or añejos (i.e. they were all clear liquid), he was taken aback. Apparently purist mezcal drinkers don’t drink anything that has been aged in wood as it destroys the pure mezcal flavor. He gave me a short lecture about the different agave types which were present in each of the mezcals I was trying and then left me to my tasting. The first, made from Penca Verde agave, tasted similar to a harsh low cost blanco tequila to me. The menu price for this one was 90 pesos per 1.5oz shot, almost $5. The second made from Agave Karwinski had a medicinal alcohol and acetone flavor which was seriously not good. Price for this was 70 pesos per shot. I dutifully tasted and re-tasted this to determine if there were characteristics I was missing, but the overwhelming sensation was that I was drinking something with nail polish remover in it. The final sample was from Agave Potatorum, which went for 110 pesos per shot. The nose had a caramel aroma to it and I was encouraged. The predominant taste however had a distinct flavor of some sort of burnt vegetable, probably agave. My favorite of the bunch, was the first one, but in saying this, I have to qualify that I would prefer a shot of El Jimador Reposado Tequila, which you can buy in any supermarket in Oaxaca for about $7 a bottle, over any of these by a mile. In short, I thought they were all bad. 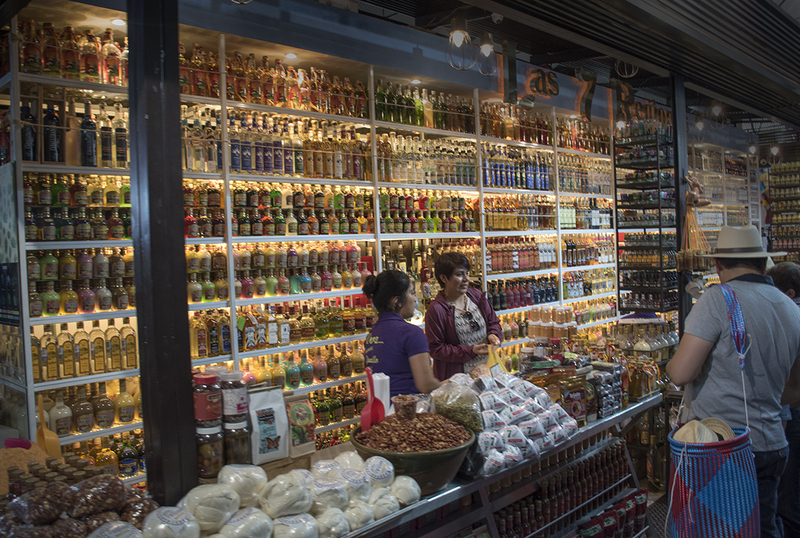 Shop with lots of mezcal at Benito Juarez market. I’m sure mezcal aficionados out there will say that I just don’t have a sophisticated palate, or that mezcal is an acquired taste which requires time and many tastings to develop. I’ve read similar comments from fans of Islay single malt scotches, who seem to think that a taste profile which begins with “medicinal peat smoke” is the measure of a great scotch. But my feeling is you like what you like and I’m willing to bet that the majority of the population would have had a similar reaction to the mezcals I tasted at In Situ. In fairness, I have found a number of mezcals that I have really liked. Most of these were “corrupted” by aging, either reposados or añejos, but even a few blancos I found acceptable, though I still prefer the aged versions. Another thing I have found is that price doesn’t equate to taste. In fact, the mezcals from my favorite artesanal mezcaleria in Oaxaca, run by the Union de Palenqueros de Oaxaca, has a selection of reposados and añejos which I like and which are priced between 120-200 pesos for 750ml unsealed bottles (more on this later). 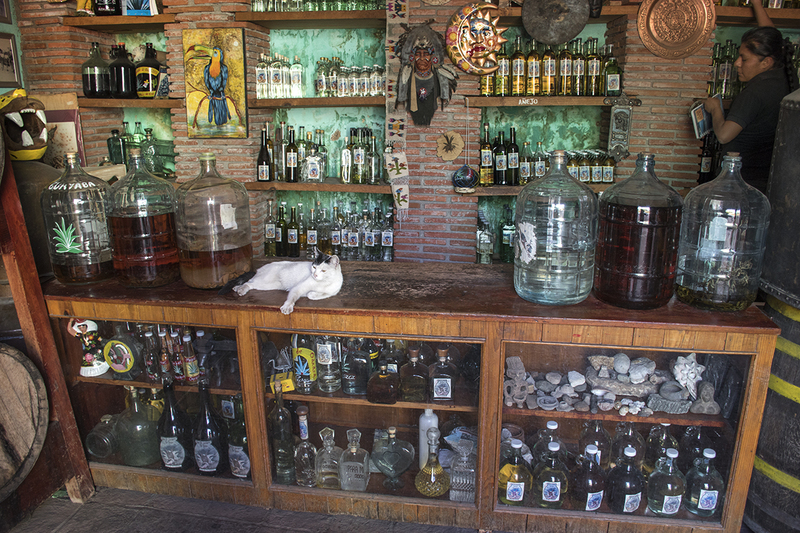 I also like the vibe of the place, with cats and dogs wandering around the store, and huge jugs of mezcal being infused with various fruits and other things I can only guess at, which gives it the feeling of an apothecary shop from 100 years ago. 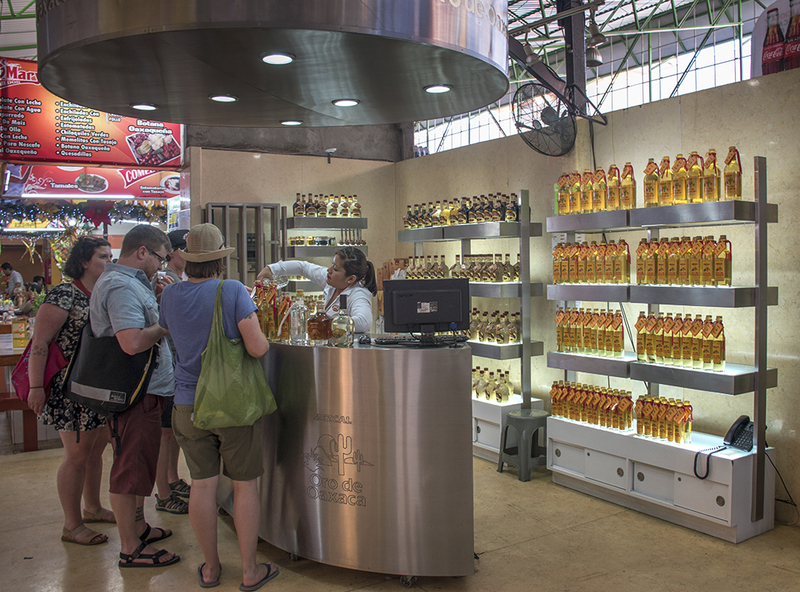 I also tasted a variety of mezcals from mezcal shops in the Benito Juarez market which were priced between 200-300 pesos which were very good. So you don’t have to pay 500-1500 pesos per bottle to get good artesanal mezcals in Oaxaca. Many shops sell a single mezcal brand, like this one. I had heard about people doing mezcal tours of small artesanal distilleries in the villages surrounding Oaxaca and decided to check into doing one of these tours with Ger. The most well-known of these tours is run by Alvin Starkman. If anyone in Oaxaca deserves the title of Professor Mezcal, it is probably him. It seems like every blog or forum I read about mezcal his name comes up or he is a contributor. I contacted him by email to arrange a tour, but unfortunately he was booked out into the future beyond our departure date. He suggested another person who did tours and we contacted that person as well. In the end we decided to skip the tours, mainly due to the cost, which was between $250-300 per person for a single day tour, not including cost of mezcal purchases. I’m sure there a plenty of people for whom this amount of money for a day tour is inconsequential, but for the two of us it’s about half our monthly travel budget. In the end I opted for trying to learn about mezcals from sampling the many products available in the city of Oaxaca itself. Ger and I have tried using mezcal in several different types of cocktails, from coffee drinks (not bad), mezcal margaritas (almost the same as a tequila margarita), to mixing it with various fruit juices. I would say in general that mixing mezcal improves its desirability as a spirit, but I still prefer the taste of tequila in any similar cocktail I’ve tried so far. Which brings me back to my original question: why would anyone purchase mezcal over tequila, given the quality available from each at a similar price point? 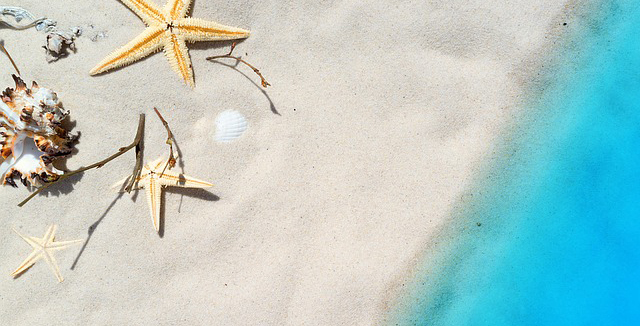 My answer is, in the U.S. I probably wouldn’t. However, as I write this I have just finished bubble-wrapping four liters of añejo mezcal from Union de Palenqueros de Oaxaca to take back to the U.S. I paid 320 pesos (about $17) for each one liter bottle. The price was a bit higher per ml than the 200 pesos they were charging for 750ml bottles because these bottles have tops which are sealed so they will be able to pass through U.S. customs. You can’t bring unsealed or unlabeled bottles of mezcal into the U.S. So, why did I break down and buy mezcal after talking about how I prefer tequila? Mainly because of the novelty and because it’s a souvenir from Oaxaca, but also because the mezcals available at this particular mezcaleria in Oaxaca are probably better than what I would have to pay five times the price for back home and I know I’ll never be willing to pay that price in Portland.